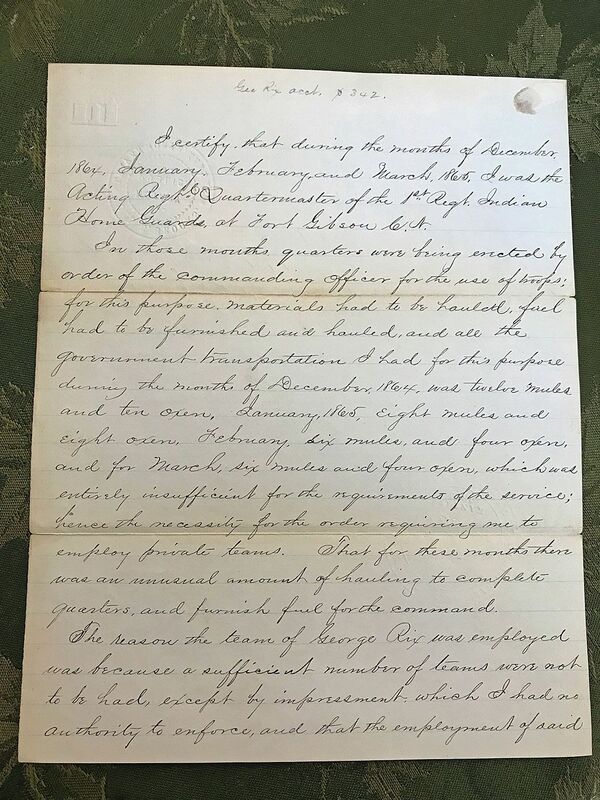 Two page manuscript document written by 1st Lt. Charles N. Rix as the A.R.Q.M. for the 1st Regt Indian Home Guard. Fold split repaired by professional archival tape, otherwise in very good condition. Also endorsed by a Notary Public on March 1st, 1866 in Leavenworth County Kansas. I certify that during the months of December 1864, January, February, and March, 1865, I was the Acting Regt. Quartermaster of the 1st Regt. Indian Home Guards at Fort Gibson C. N.
In those months quarters were being erected by order of the commanding officer for use of the troops; for this purpose materials had to be hauled, fuel had to be furnished, and hauled, and all the government transportation I had for this purpose during the months of December 1864, was twelve mules and ten oxen, January 1865, eight mules and eight oxen, February, six mules and four oxen, and for March, six mules and four oxen, which was entirely insufficient for the requirements of the service; hence the necessity for the order requiring me to employ private teams. That for these months there was an unusual amount of hauling to complete quarters, and furnish fuel for the command. team was under the order, direction and instructions of the commanding officer. The emergency was such that the employment of private teams was absolutely necessary, and entirely unavoidable, and that the timber for the building of quarters and the fuel, had to be hauled a distance of 2 miles and upwards. Late 1st Lt. & A.R.Q.M. 1st Regt. Indian H. G.
Organized at Leroy, Kansas, May 22, 1862. Attached to Dept. of Kansas to August, 1862. 3rd Brigade, Dept. of Kansas, to October, 1862. 3rd Brigade, 1st Division, Army of the Frontier, Dept. of Missouri, to February, 1863. District of Northwest Arkansas, Dept. of Missouri, to June, 1863. District of the Frontier, Dept. of Missouri, to December, 1863. 1st Brigade, District of the Frontier, Dept. of Missouri, to January, 1864. 1st Brigade, District of the Frontier, 7th Army Corps, Dept. of Arkansas, to February, 1864. Indian Brigade, District of the Frontier, Dept. of Arkansas, 7th Army Corps, to February, 1865. 3rd Brigade, 3rd Division, 7th Army Corps, to May, 1865. SERVICE.--Expedition into Indian Territory May 25-July 28, 1862. Locust Grove, Cherokee Nation, July 3. Bayou Bernard July 27-28. Blount's Campaign in Missouri and Arkansas September 17 to December 3. Occupation of Newtonia October 4. Fort Gibson October 15. Old Fort Wayne or Beattie's Prairie, near Maysville, October 22. Between Fayetteville and Cane Hill November 9. Camp Babcock November 25. Cane Hill, Boston Mountains, November 28. Capture of Fort Davis December. Operations about Cane Hill December 4-6. Reed's Mountains December 6. Battle of Prairie Grove December 7. Expedition over Boston Mountains to Van Buren December 27-29. Capture of Van Buren December 29. Sent to Indian Territory January, 1863, and occupy line of the Arkansas River to protect friendly Indians, with Headquarters at Fort Gibson, I. T., and Fort Smith, Ark., until May, 1865. Action at Bentonville, Ark., February 20, 1863. Fort Blount April 30 and May 20. Fort Gibson, Cherokee Nation, May 22 and 25. Fort Blount June 9. Operations about Fort Gibson June 16-20. Greenlief Prairie June 16. Cabin Creek July 1-2. Elk Creek, near Honey Springs, July 17. Cabin Creek July 20. Creek Agency October 15 and 25. Repulse of Quantrell's attack on Fort Gibson December 16. Near Sheldon Place. Barren Fork, December 18. Operations in Indian Territory February 1-21, 1864. Cabin Creek September 19. Expedition from Fort Gibson to Little River and Hillabee March 18-20, 1865. Mustered out May 31, 1865. Report of Col. Stephen H. Wattles, First Indian Home Guards. HDQRS. FIRST REGT. OF INDIAN HOME GUARDS, Fort Blunt, C. N., July 18, 1863. COL.: On the morning of the 17th of July, 1863, we came upon the enemy at Elk Creek. My command was ordered to the left, in support of Hopkins' battery, and then ordered to charge the enemy out of the timber. I advanced, under a destructive fire from the enemy, after hard fighting, gained a position in the timber, and finally drove them across the stream, on the left of the bridge, the enemy forming several times, and desperately contenting every foot of ground. Too much praise cannot be awarded to both officers and men for their gallant conduct in the battle. Among the former who did efficient service were Lieut. Col. George Dole, who had command of the left wing, and was the first to cross the stream, which he accomplished, under a most galling fire from the enemy, who were formed on the opposite side; Actg. Adjt. E. C. Lowe, Capt. 's No-ko-so-lo-chee and So-nuk-mik-ko, and Lieuts. R. T. Thompson, Fred. Crafts, Fred. R. Jacobs, and Charles N. Rix. Of the latter who deserve honorable mention are O. P. Willetts, A. Flanders, and Thompson Overton. My loss was: Killed, 2; wounded, 6; missing, none. Number of guns captured, 24. STEPHEN H. WATTLES, Col., Cmdg. First Indian Regt.